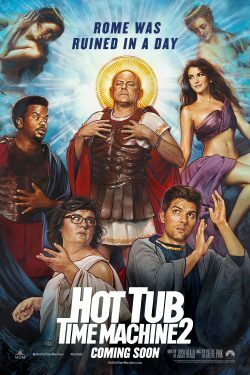 It’s still quite a while off until we see what the Hot Tub Time Machine will be doing a second time around. Before that, we have been sent over two posters for the film. It seems that the gang have not only been to the future to save the past but are also messing around in the past. Who knows what they have got up to that time. It does seem that they have been having a blast in ancient Rome and a little closer to today with a trip to NASA and the moon! I could be very geeky now and talk about the space suits but I ave already covered that in a previous post on this blog. All I’m going to say is they look like early Apollo Block II suits. They are the style of posters that I grew up with in the 70s and early 80s. Where posters were drawn and not a photoshop montage as they are today. 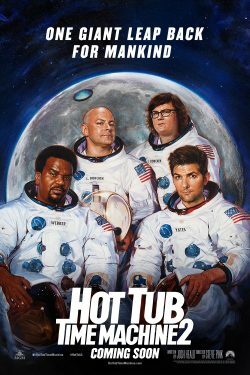 When Lou finds himself in trouble, Nick and Jacob fire up the hot tub time machine in an attempt to get back to the past. But they inadvertently land in the future with Adam Jr. Now they have to alter the future in order to save the past… which is really the present, in the sequel from the same team that brought you the original cult hit.